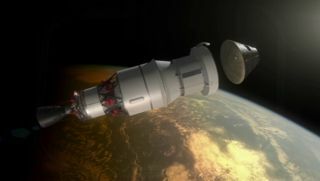 This NASA animation still shows the Orion capsule separating from its rocket during the Exploration Flight Test-1, an unmanned flight demonstration targeted for 2014 to test the Orion vehicle and re-entry systems. NASA's new spaceship to carry astronauts off the planet may launch on an unmanned test flight by 2014, three years earlier than planned, to mimic a return from deep space, agency officials said Tuesday (Nov. 8). The proposed test flight, called the Exploration Flight Test 1, would launch a robotic version of NASA's Orion Multi-Purpose Crew Vehicle on a two-orbit spaceflight. The capsule would then re-enter the Earth's atmosphere in an ultra-fast descent to recreate some of the scorching hot temperatures it would experience during a return from a deep space trip to an asteroid — a goal set for NASA by President Barack Obama. "The entry part of the test will produce data needed to develop a spacecraft capable of surviving speeds greater than 20,000 mph and safely return astronauts from beyond Earth orbit," said William Gerstenmaier, NASA's associate administrator for human exploration and operations. "This test is very important to the detailed design process in terms of the data we expect to receive." Such a flight would mark an earlier debut for the Orion capsule, which was previously slated for a December 2017 launch test atop NASA's new mega-rocket, the Space Launch System. NASA's Orion deep space capsule is being built by aerospace veteran Lockheed Martin Space Systems and the unmanned test flight proposal would add that first flight to NASA's current contract with the company, agency officials said. "What the management realized is that we can actually do this on a commercial rocket," Byerly said. "It can actually get [the capsule] up high enough to get a pretty good return velocity." The flight test would send the Orion capsule plunging back to Earth at a staggering 30,280 feet (9,229 meters) per second, which is about 84 percent of the speed NASA's Apollo spacecraft hit during their return trips from the moon. According to NASA's mission plan, the Orion Exploration Flight Test 1 would splash down in the ocean at the end of its two-orbit flight. The capsule would then be retrieved by a recovery crew, allowing NASA to practice the techniques needed to recover a crewed Orion capsule. The test flight would launch from Cape Canaveral Air Force Station in Florida and be watched over by launch controllers at NASA's Kennedy Space Center, Byerly said. Another flight control team would watch over the test from NASA's Mission Control at the Johnson Space Center in Houston. According to a NASA description, the 2014 test flight would allow the space agency to perform "earlier and more robust testing of critical Orion spacecraft systems that contribute to 10 of the 16 highest risks to crew survivability and exploration mission failure." The Orion spacecraft is NASA's next vehicle to carry astronauts into space. NASA's new Space Launch System, a towering booster that would be the most powerful rocket ever built when fully realized, will serve as the launch vehicle for Orion and other deep space exploration hardware. The space agency retired its iconic space shuttle fleet in July after 30 years of service and currently plans to rely on privately built, commercial space taxis to ferry U.S. astronauts to and from the International Space Station until the Orion spacecraft is operational. NASA's new space exploration plan, unveiled by President Obama in April 2010, is to send astronauts to visit an asteroid by 2020, then aim for a manned Mars mission in the 2030s.